Dr. T.M.P. Mahadevan was perhaps one of the very few devotees of Sri Ramana Maharshi who had not only a clear grasp of his teachings but understood their historical relevance in the field of philosophical thoughts. 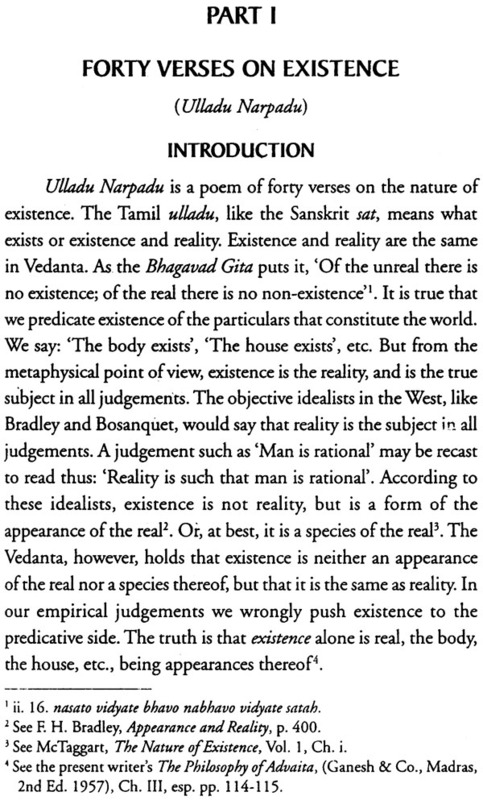 “Ulladu Narpadu” (Forty Verses on Reality) and its Supplement is widely considered the Maharshi’s quintessential scripture, embodying the most precise expression of Reality written by a sage who experienced it. With the remarkable clarity of a refined and disciplined intellect, the author’s translation and interpretation of this sublime composition will certainly inspire spiritual seekers and students of philosophy alike. 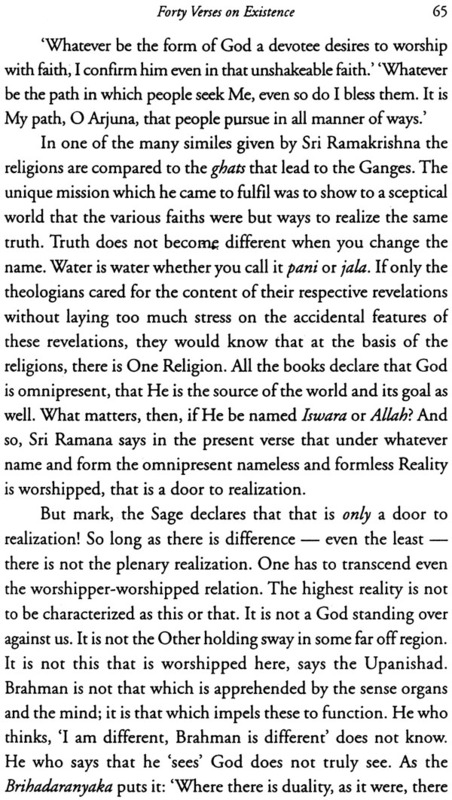 As a student of the Upanishads, I have often wondered at the way in which the sages should have discovered and taught the truths enshrined in them. On reading these texts one is convinced that those who were responsible for revealing them were not speaking from mere second-hand knowledge. There is an unmistakable ring of authenticity and directness about them. The Upanishadic teachings do not seem to be of the nature of idle speculations about, or wild guesses at Reality: every teacher would appear to say in effect, ‘I have seen what I now declare; you are welcome to see for yourself’. It is the same ring of authenticity and directness that one finds in the teachings of the sages of modern India also, like Ramakrishna and Ramana. Ramana Maharshi, the subject of the present book, did not first read and speculate, and then experience and expound. He first experienced the ultimate Reality and then expounded it, mostly through silence and sometimes through words, spoken and written. There was now the problem of the deleted verses; and they did not come up to forty So, Sri Ramana had to write a few more verses. 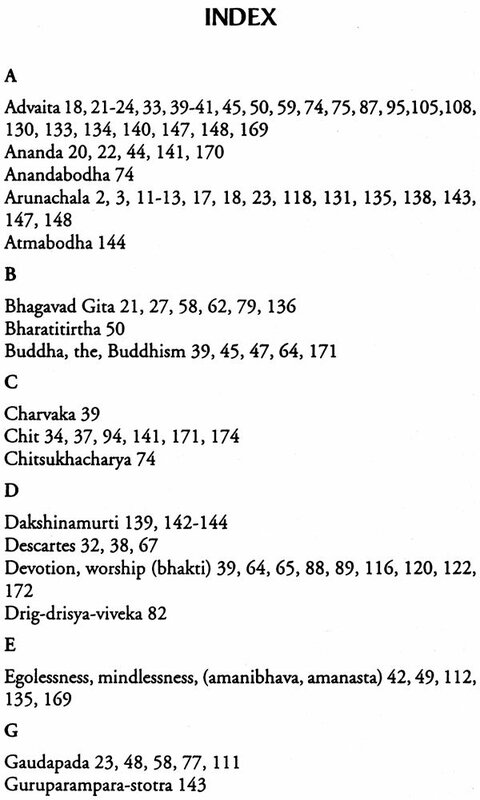 Quite a few of these were Tamil renderings from other sources such as the Yoga Vasishta. The supplementary forty verses came thus to be added to the forty on ‘Existence’. ‘Existence’ in Vedanta is a term which indicates the nature of the highest Reality. 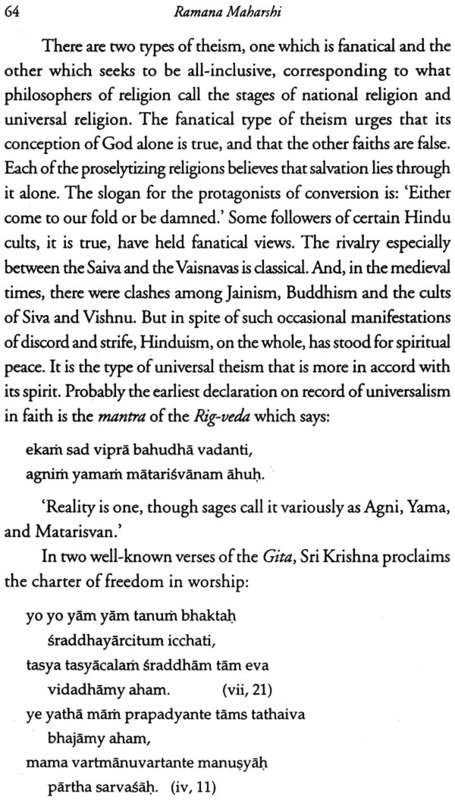 Brahman-Atman is existence, sat (Sanskrit), ulladu (Tamil). It is not bare existence; it is existence that is consciousness (chit) and bliss (ananda). 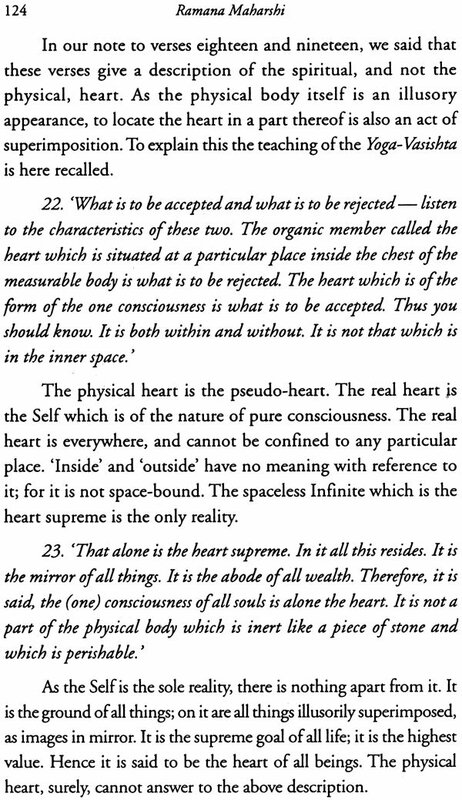 The Upanishads and the Vedanta that is based thereon and whose greatest exponent was Acharya Sankara teach about the Reality that is Existence. 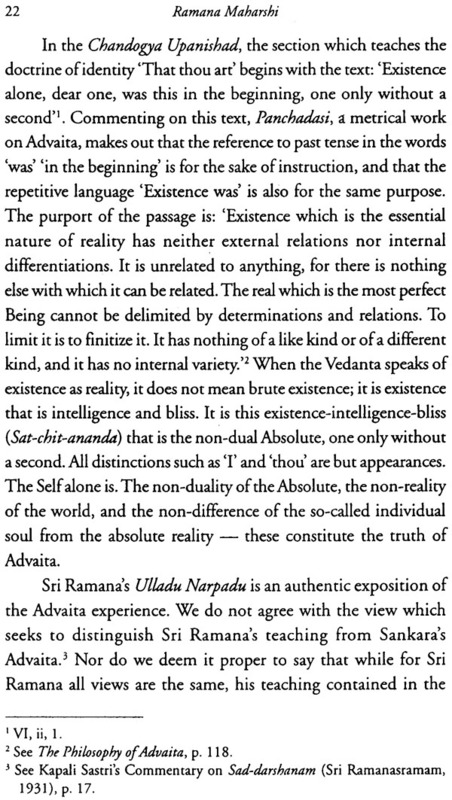 Hence it is that Vedanta is called sadvidya (knowledge of Existence). 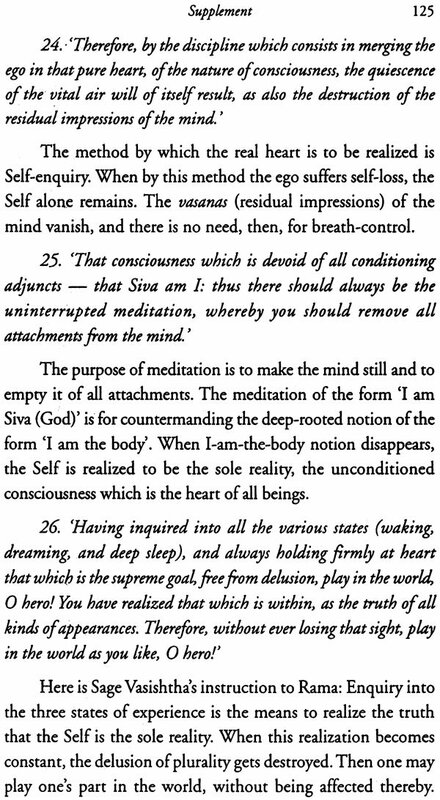 Sri Ramana’s Forty Verses along with The Supplement constitute a concise and precise statement of the truth of Vedanta. 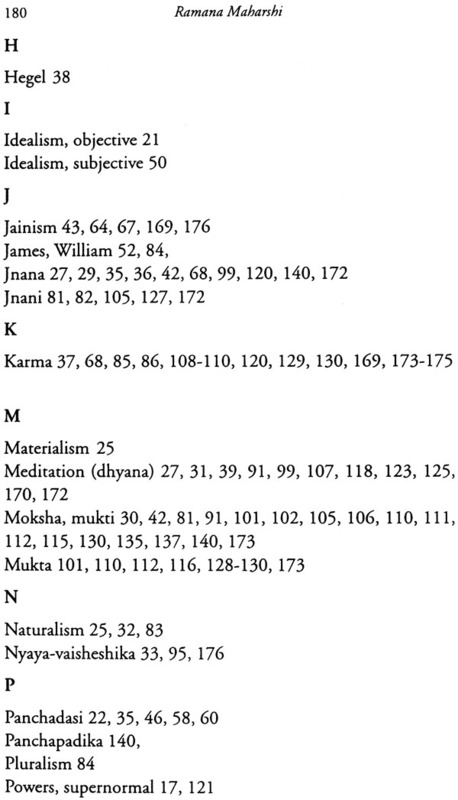 Of the present book, The Forty Verses and The Supplement form parts one and two. In part three appear some of my essays on the significance of Bhagavan Ramana’s life and teaching. The original Tamil text of The Forty Verses and The Supplement is given at the end in transliterated Roman script. The short biography of Sri Ramana which I wrote for a book on The Saints commissioned by the Southern Languages Book Trust, Madras, has been included here as the Introduction. This has also been reprinted by Sri Ramanasramam in the form of a booklet for the convenience of the general readers. For assistance rendered in connection with this publication, I must express my thanks to my colleagues in the University Department of Philosophy, Dr. V. A. Devasenapathi and Sri P. K. Sundaram, and to Sri T P. Ramachandran, Research Fellow in Philosophy. I am happy that this book is being published by Sri Ramanasramam. The Scriptures tell us that it is as difficult to trace the path a sage pursues as it is to draw a line marking the course a bird takes in the air while on its wings. Most humans have to be content with a slow and laborious journey towards the goal. But a few are born as adepts in flying nonstop to the common home of all beings — the supreme Self. The generality of mankind takes heart when such a sage appears. Though it is unable to keep pace with him, it feels uplifted in his presence and has a foretaste of the felicity compared to which the pleasures of the world pale into nothing. Countless people who went to Tiruvannamalai during the lifetime of Maharshi Sri Ramana hid this experience. They saw in him a sage without the least touch of worldliness, a saint of matchless purity a witness to the eternal truth of Vedanta. It is not often that a spiritual genius of the magnitude of Sri Ramana visits this earth. But when such an event occurs, the entire humanity gets benefited and a new era of hope opens before it. About thirty miles south of Madurai there is a village Tiruchuzhi by name with an ancient Siva temple about which two of the great Tamil saints, Sundaramurti and Manikkavachakar, nave sung. In this sacred village there lived in the latter part of the nineteenth century an uncertified pleader, Sundaram Aiyar with his wife Alagammal. Piety, devotion and charity characterized this &amp;amp;amp;amp;al couple. Sundaram Aiyar was generous even beyond his measure. Alagammal was an ideal Hindu wife. To them was born Venkataraman who later came to be known to the world as Ramana Maharshi — on the 30th of December, 1879. It was an auspicious day for the Hindus, the Ardra-darshanam day. On this day every year the image of the Dancing Siva, Nataraja, is taken out of the temples in procession in order to celebrate the divine grace of the Lord that made Him appear before such saints as Gautama, Patanjali, Vyaghrapada, and Manikkavachaka. In the year 1879 on the Ardra day the Nataraja Image of the temple at Tiruchuzhi was taken out with all the attendant ceremonies, and just as it was about to re-enter, Venkataraman was born. There was nothing markedly distinctive about Venkataraman’s early years. He grew up just as an average boy. He was sent to an elementary school in Tiruchuzhi, and then for a year’s education to a school in Dindigul. When he was twelve, his father died. This necessitated his going to Madurai along with the family and living with his paternal uncle Subbaiyar. There he was sent to Scott’s Middle School and then to the American Mission High School. He was an indifferent student, not at all serious about his studies. But he was a healthy and strong lad. His schoolmates and other companions were afraid of his strength. If some of them had any grievance against him at any time, they would dare play pranks with him only when he was asleep. In this he was rather unusual; he would not know of anything that happened to him during sleep. He would be carried away or even beaten without his waking up in the process. It was apparently by accident that Venkataraman heard about Arunachala when he was sixteen years of age. One day an elderly relative of his called on the family in Madurai. The boy asked him where he had come from. The relative replied ‘From Arunachala’. The very name ‘Arunachala’ acted as a magic spell On Venkataraman, and with an evident excitement he put his question to the elderly gentleman, ‘What! From Arunachala! Where is it?’ And he got the reply that Tiruvannamalai was Arunachala. Referring to this incident the Sage says later on in one of his Hymns to Arunachala: ‘Oh, great wonder! As an insentient hill it stands. Its action id difficult for anyone to understand. From my childhood it appeared to my intelligence that Arunachala was something very great. But even when I came to know through another that it was the same as Tiruvannamalai I did not understand its meeting. When, stilling my mind , it drew me up to it, and I came close, I found that it was the Immovable. Quickly following the incident which attracted Venkataraman’s attention to Arunachala, there was another happening which also contributed to the turning of the boy’s mind to the deeper values of spirituality. He changed to lay his hands on a copy of Sekkilar’s Periyapuranam which relates the lives of the Saiva saints. He read the book and was enthralled by it. This was the first piece of religious literature that he read. The example of the saints fascinated him; and in the inner recesses of his heart he found something responding favourably. Without any apparent earlier preparation, a longing arose in him to emulate the spirit of renunciation and devotion that constituted the essence of saintly life.